As the original Lumines was a launch title for the original PSP (and a personal system seller) it's very fitting that Lumines Electronic Symphony is gracing the Vita launch line-up. It's also feels like the freshest Lumines in many years, with completely new levels, music, and touch features that take advantage of the handheld. The most notable change is with the level progression. 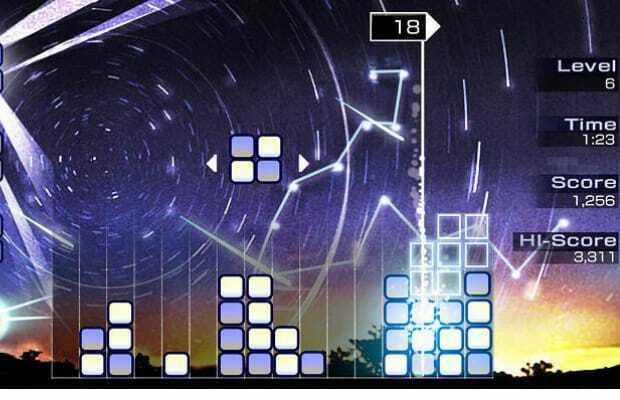 In previous Lumines, score milestones had to be reached in order to experience new levels in the same playthrough. This time around you can unlock these later stages simply through repeated play. Each skin has three escalation points where the background animation changes whenever each point is reached. Moreover, art assets (including the puzzle blocks) are now animated 3D objects, not the 2D sprites of past games. Thinking about the internal musical talents of Q? Entertainment with the Child of Eden soundtrack not to mention Tetsuya Mizuguchi's great taste in music, I'm especially stoked that L.E.S. will feature 10 original compositions and 33 licensed tracks. Just as Lumines ushered in the PSP, the beat goes on in this invigorating Electronic Symphony for the Vita. And you don't stop. This is unquestionably one of the top 5 Vita games to get at launch.